Peppers are plentiful at the moment and pickling them is a great way to preserve summer’s bounty. Nothing tastes better than home canned items on a cold winter day. The process of canning peppers and only takes a few hours. 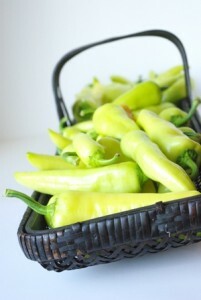 I used banana peppers for canning, but any pepper will work. You can also mix different types to make a colorful pepper blend. To make 8 pints of canned peppers I started with one half of a five gallon bucket of peppers. That is a precise measurement… I know. I picked these pepper straight from the garden into a bucket, so that is as precise as I will be. Thoroughly wash jars and dry. 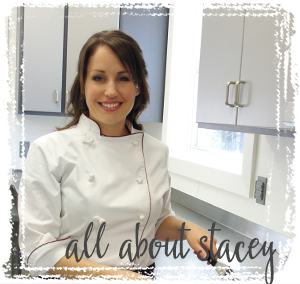 Place on a cookie sheet and into a 200 degree oven until you are ready to use them. When canning you should always work with hot jars, so that adding your hot canning liquid does not shock and break the jars. 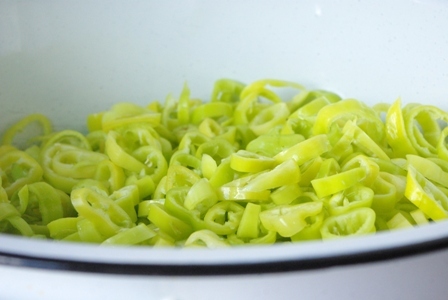 To begin place your peppers in a sink full of water to wash. Core the peppers with a small knife and remove the seeds. You can rinse the pepper to remove any stubborn seeds. Next, slice the peppers to your desired thickness. 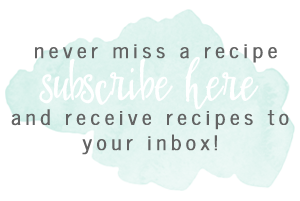 Remove your hot jars from the oven. Fill jars with sliced peppers- pack them tightly. I put one small whole pepper in each jar just for fun. Next, using a jar funnel, ladle hot vinegar mixture into jars, leaving about 3/4 and inch of room at the top. Using a butter knife poke into the jars to remove any air bubbles. Using a clean, wet dishcloth wipe the tops of each jar. With tongs, or a magnetic lid grabber, remove lids from the boiling water. 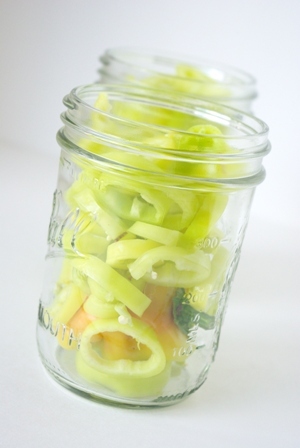 Place on jars and quickly screw on jar rings. With the jar lifter, place jars in hot water bath pot- it should be simmering. The water should cover the jars by 1-2 inches. Cover the pot and bring water to a boil. Once boiling set timer for 10 minutes. After 10 minutes, carefully remove jars with the jar lifter and place on folded towel. Do not disturb jars once removed. They should make a popping noise within about an hour, that is the lid suctioning on to the jar and sealing. 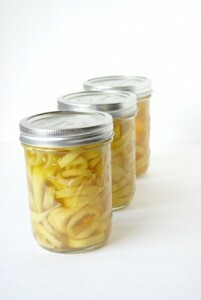 Once all jars are sealed allow to cool, label them, then store for up to one year. Once jars are opened they must be refrigerated. Before you begin working the peppers it is important to collect all of our canning supplies. For this project you will need a hot bath pot (a large pot with a rack in the bottom to keep jars from touching the bottom of pan), a jar lifter, jar funnel, 8 pint jars with lids and rings, cookie sheet, ladle, tongs, large towel. Fill your hot bath pot with enough water to cover the jars by 1-2 inches. Bring pot to a simmer. Place jar lids, not rings, into a shallow pan with water and bring to a simmer. It is important that they be hot when putting them on the jars. 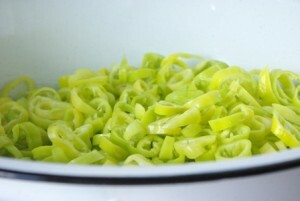 To prepare vinegar mixture place all ingredients in a medium stock pot and bring to a simmer. Thoroughly wash jars and dry jars. Place on a cookie sheet and into a 200 degree oven until you are ready to use them. when canning you should always work with hot jars, so that adding your hot canning liquid does not shock and break the jars. 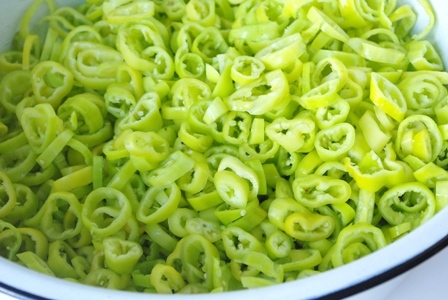 To begin, place your peppers in a sink full of water to wash. Core the peppers with a small knife and remove the seeds. You can rinse the pepper to remove and stubborn seeds. Next, slice the peppers to your desired thickness.